This years' Astrid Lindgren Memorial award was announced yesterday at the Bologna Book Fair. 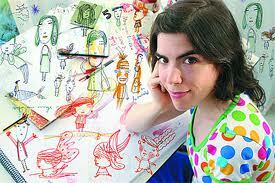 Argentine illustrator, writer and cartoonist Isol has been awarded the €700,000 award, being praied by the judges for her "energy and explosive emotions". Published in over 20 countries, Isol is the author of 10 books and the illustrator of a further 10 titles. 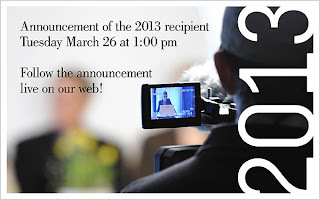 The 2013 Astrid Lindgren Memorial Award for 2013 will be announced Tuesday, 26 March at 1pm. The list of worthy nominees for this prestigious award is far to long to recite here. But here's the link that will get you all the information you need. And you can also follow the announcement live on their website! Your special World Book Day tokens for this year will expire on Sunday 24 March, 2013.... THAT'S THIS SUNDAY!!!!!! You have 3 days to use them up. After this Sunday, they are no longer valid for use and cannot be accepted. So fight the weather if you have to (safely, of course... don't be foolish) and get down to your local bookshop. You can exchange them for one of the nine specially published World Book Day Books... or use them to get €1.50 off any other book of your choice. 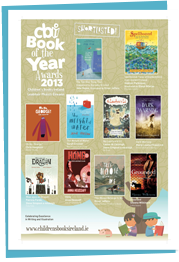 The CBI Book of the Year Awards (the leading childrens' book awards in Ireland) shortlist for 2013 was revealed today. There are 10 titles, each of which is competing for 6 different awards. Included in the awards is the Children's Choice Award, which, personally I feel is the most coveted. This award is voted for by a panel of 10 young juries from across the country to select the one book that children favour above the others. I've always said, if you want to know if a childrens' book is really good.... ask a kid. The awards winners in all six categories will be announced at a ceremony held on May 8. Now, there's an amazing list! So incredibly difficult to choose a favourite.... good luck and congratulations to all the author/illustrators. This is just a quick reminder to everyone out there. Thanks to National Book Tokens and a vast array of wonderful publishers, and working in partnership with schools everywhere, the World Book Day book tokens were distributed through the schools with the idea that every child would receive a token. Then, these wonderful people published the wonderful, exclusive World Book Day books to for children to receive in exchange for a WBD token. Yes, that's right... a book for every child for free. How amazing is that. YOUR WORLD BOOK DAY 2013 BOOK TOKENS ARE ONLY VALID UNTIL THE 24TH MARCH. To close off the World Book Day Extravaganza, I thought you'd be interested in our visiting authors' websites and blogs. So here's the list of where you can find these wonderful people and learn more about their books, storytellings, illustrations and what they'll be up to next. This one may be an older site, but you can find Trish's updates on facebook! The creator of The Father of Lies Chronicles has a website devoted to all things Arthur Quinn. Check it out! Busy lady Sadie Cramer has a site which will give you everything you need to know about her work, her efforts to inspire creativity and original thought and her next big adventures. Paula is always a delight! So interesting, so informative and so many wonderful tales to tell. Here's the link to her site where you'll get the inside stories on her books, her life and her upcoming book, The Sleeping Baobab Tree. Debbie's books are SOOOOO much fun, and great reads to boot! 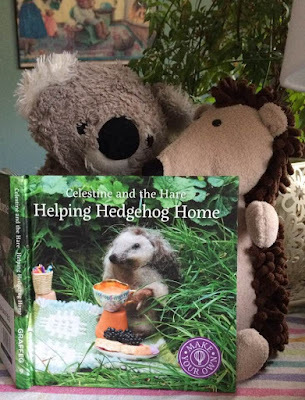 If you want to find out more about her brilliant stories and what Squashy Grandma will be up to next, here's the place to go. As for me, who filled in the blanks in the schedule with the greatest of pleasure (I always love reading to the kids) I hope you enjoyed my offerings, and.... well.... you don't need to know where to find me, because you're already here! Today marked the fifth and final day of the annual World Book Day Extravaganza. And what a wonderful day it was! Four sessions catering to a total of 117 children, all enthusiastic, all with brilliant ideas and questions and a huge love of reading... this is what we love to see! The star attraction for our final day of events was a visit from Debbie Thomas, author of the fantastically funny, wonderfully written and wildly imaginative books, Dead Hairy and the new Jungle Tangle. The kids really loved Debbie. While chatting about writing, creating characters and plot lines and how her books came into being, you could sense there were some truly gifted writers just waiting for their moment to emerge. This was the perfect way to round off a week of excitement and fun. And a huge thank you to all 599 brilliant students and their teachers, who make the World Book Day Extravaganza the best week of the year. HAPPY WORLD BOOK DAY TO YOU ALL!!! Paula Leyden, author of The Butterfly Heart (a truly beautiful book that is on my absolute must-read list for everybody). Paula spoke of many, many things African..... her life there, the land, the people, the many, many different languages, the animals; and gave a reading from The Butterfly Heart. All the students were enthralled. Their energy and enthusiasm was infectious. Thank you so, so much, Paula!!! It was a pure delight having you. 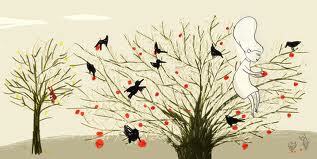 And I am really looking forward to your upcoming book, The Sleeping Baobab Tree (out in May). It was another fantastic day in the bookshop, with school classes being treated to appearances by Maria Burke, author of The Ark of Dun Ruah (see review on the Irish Authors and Publishers page) and Sadie Cramer, illustrator of Chop Chop, Mad Cap (author Juliette Saumande). Maria came all the way from Cork to see two separate classes, and regaled them with readings from The Ark of Dun Ruah, and much interesting information about eagles, owls and writing. It was fascinating, and I know (from their enthusiasm) the children were just as excited about it as I was. Sadie came in and delighted a local school 2nd/3rd class with her tales of illustration, what she'll is up to next and a workshop in which all the girls made their own identity badges (with their own secret identities). And, of course, there was a reading from Chop Chop, Mad Cap that left us all wanting more! Thanks go out to Maria and Sadie for all their hard work, sharing their talents and joy of books.... and the wonderful books they have written and illustrated! You are both absolutely fantastic!!! "The Biggest Book Show On Earth will be streamed LIVE via www.worldbookday.com at 11am on Thursday 7th March 2013! If you have registered to watch (and if you haven’t there’s still time to do so HERE), ensure that your audience will be able to enjoy the show by making sure you’ve done the following technical checks in advance of the event. You should test your set-up in your venue as it will be set up on the day. Please make sure you can see the on-demand video after registering or logging in. Ideally, everyone would be watching from one room/location, but your IT dept/local technicians will be able to help you find out if you can watch in either one or more classrooms. Please ask your IT dept/local technician to test your internet bandwidth speed at www.speedtest.net. Each classroom will require 1 megabyte download speed minimum (ideally 3 megabytes DL speed). If you only have this speed for the whole school then only ONE classroom/assembly hall will be able to watch the show at one time (if more watch the show the stream will start to buffer and break up). Enjoy the show! And don’t forget you’ll be able to watch it again on-demand on www.worldbookday.com from Friday 8th March." So for those of you out there who won't be making it to a World Book Day event, don't dispare! World Book Day Has you covered. Today was absolutely marvellous! After a great story-time session with a wonderful class group of Junior & Senior Infants from the Claddagh National School, we were treated to another very special guest! Alan Early came to Dubray Books in Galway and entertained, informed and completely mesmerised three separate classes of 5th and 6th class students from St. Patricks School, St. Nicholas Parochial and Claddagh National School. All the students were lively and engaged. Thank you so very much, Alan!!! You really made my day! By the way, if you are following the 'head count', we had exactly 150 students come through today. That brings are total for the week so far to 267! BRING IT ON! Hello, hello, hello....and welcome to March! As our thoughts turn to leaving behind the dreary winter months, you know what that means.... it's time for the World Book Day Extravaganza. For 2013, it's 5 days, 20 school classes from Galway city, 7 GREAT author/storytellers and all the bookish excitement, drama and joy I can cram into a week. And it all started today. and those who it would not have been possible without; the schools, teachers and 117 children from St. Nicholas Parochial School and Claddagh School. Thank you, thank you, thank you!!!! Now.... I've got to get ready to do it all again tomorrow.